The Navy’s first new class of aircraft carriers in almost 50 years has had its share of developmental issues with mission critical systems. Built under a damning concurrent procurement model, the ship’s catapults, radar, arresting gear and other critical systems remain mired in developmental chaos, even though the ship is less than a year away from setting sail. Make sure to read the article above for a full background on the super blunder that is concurrency and how it relates to the USS Gerald R. Ford. The Navy has long wanted to get the Gerald R. Ford operational as soon as possible, especially considering America’s already looming “carrier gap.” Under their corner-cutting plan to make this happen, the Navy deferred shock trials of the Gerald R. Ford until the next $12B+ dollar carrier in the class, the USS John F. Kennedy, was fully built and available for these trials. This would be many years after the untested, an potentially vulnerable, Gerald R. Ford would be operational, supposedly. This horrible decision has thankfully been overturned by Navy Secretary Ray Mabus. The downside is that it could delay the USS Gerald R. Ford’s introduction into the fleet by almost half a year. Still, this decision makes sense, as the ship’s design and systems can be tested against nearby explosions before it may go to war and especially before another ship can be fully built of the same design, thus making changes much more cost effective if they need to be made as a result of data garnered from these shock tests. 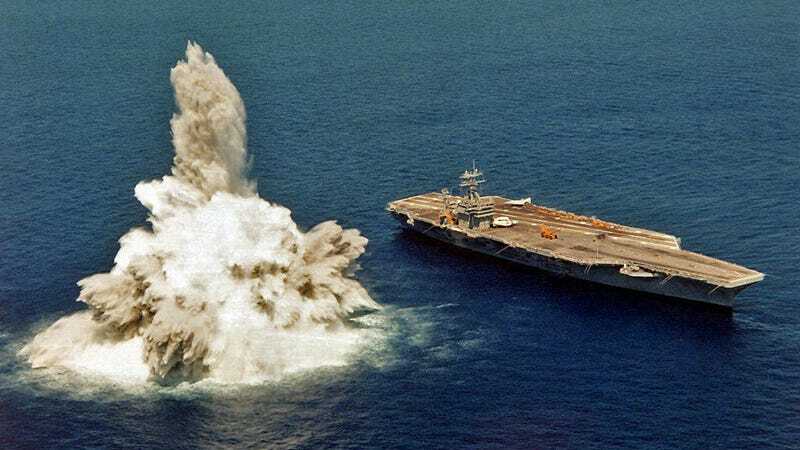 This decision also gives the Navy a little bit more time to work the kinks, many of them large, out of the other key systems without blaming the carrier’s delay into service on them. Such a delay would make huge headlines and would be a massive embarrassment for the Navy who is already being heavily criticized on the cost and system issues of their new super carrier. In the end, ordering shock trials on the USS Gerald R. Ford kills two birds with one stone. One of them has to do with simply validating a warship’s design using proven practices. The other is quite political, giving the a ship plagued with problems more time to mature without explicitly saying more time is needed to do so. Still, even a delay of up to six months may still not be enough time to fix the many issues with key systems aboard the ship. Regardless of if the Navy’s true motive for the delay is to once again let proven practices dictate weapon system testing and development, or if it is indeed to buy some time from a publicity hell storm brewing on the horizon, in the end those who serve aboard USS Gerald R Ford once it finally becomes operational will be the ones who benefit, and this is a good thing.